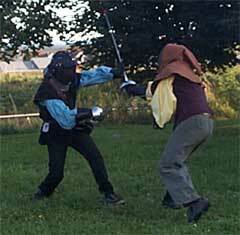 Swishy-swishy pokey-pokey at the Northern Shores Regional Warcamp and Schola, May, 2005 This shot was taken during the Northern Shores Regional Rapier Championship, ultimately won by Don Cosmano Piero Michellotto Da Roma. Left to right: Lord Guthfrith Yrlingson, Tiberius Tarius Britannicus (the runner-up in the finals), and me (with my sword-tip way off-target). 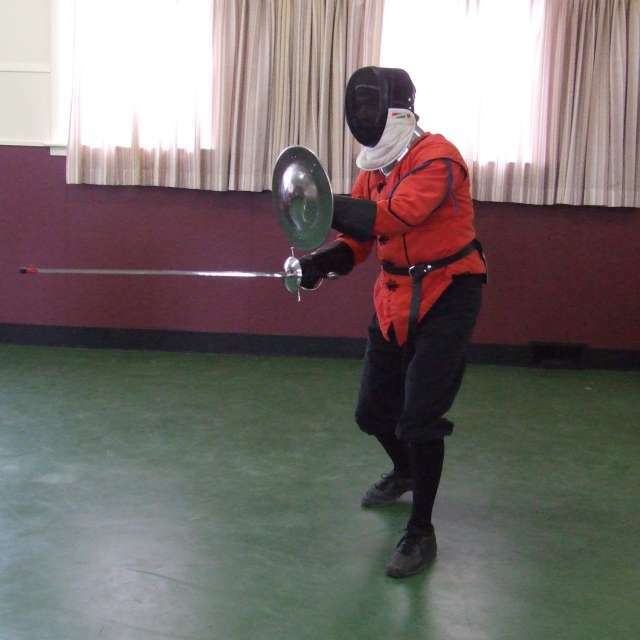 This is my brand-new fencing armour. Much more comfy than my old gear. I have since removed the brown external hood, and started wearing a black hood inside the mask and under the collar. Not as cool looking, but more convenient for putting the mask on and off, plus there is no risk of the bib lifting the hood away from my chest and exposing my throat. My new hood has been drop-tested, which the old hood was not. An internal hood also reduces the amount of perspiration that comes in contact with the inside of the mask, thereby extending its life. This is most of my old outfit, except for the pants, which were the same brown as the hood. 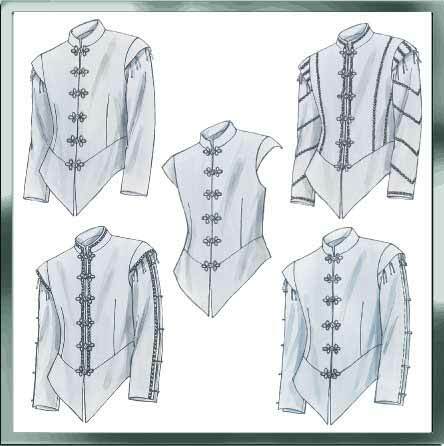 The red doublet pattern was modified from one of the McCalls M4695 "Men's Rennaisance Doublets" pattern, as shown below. It still needs a some more black trim, sort of like the view in the upper right of the McCalls illustration. As it was, the last of the frogs were sewn on in the car on the way there, and the cuffs were finished the morning of the tourney, with my Goode Wyfe Siobhan working on one side and Mártoni Szarvas Kató on the other. The other gimmick is that the front opening has a puncture-proof flap on the inside that zips up behind the vertical strip of trim just to the left of the opening. The trim conceals the stitching for the zipper. The zipper goes down to halfway between the bottom frog and the points of the peplum. The six frog fasteners are more for decoration than anything else. The pants are just simply baggy draw-string pants with elastic at the cuff. The shoes are black soft leather Reebok™ Walking Shoes with the logo blacked out, The Reeboks fit me very well (I can get them in size 9 1/2), they provide good footing on any surface, and they don't look too obviously modern from a distance, being sort of a brogue to go with the vaguely Celtic look of the doublet. The socks were the hardest item to find. They all have logos and/or stripes on them. I ended up buying black Nike™ soccer socks, and had to black out the "swoosh" logo on the shins. Synthetic yarn (lycra and polyester, I think), fairly thick, and they can go up past my knees, so there's little risk of them slipping down below the pant cuffs. Unfortunately, the swoosh has a habit of washing out to grey, and I haven't found anything permanent. Black leather dye doesn't work, and I have to keep using a black Sharpie permanent marker on it. You can still see it, up close. Funny anecdote about this: At the Ruantallan Baronial Warcamp I was in a tourney, and received a simultaneous tip cut from Gruffyd the Innocent, across both shins. After the bout my Gruffyd noticed the dark swoosh marks and asked if he had actually cut my socks. A bit of news: On July 2, 2005, I received my blue cord, from the hand of her Excellency Esperanza Razzolini d'Asolo, at Court during the Ruantallan Baronial Warcamp, with the Lady Elise ferch Morgan ap Owen (gold cord - Captain) standing by. 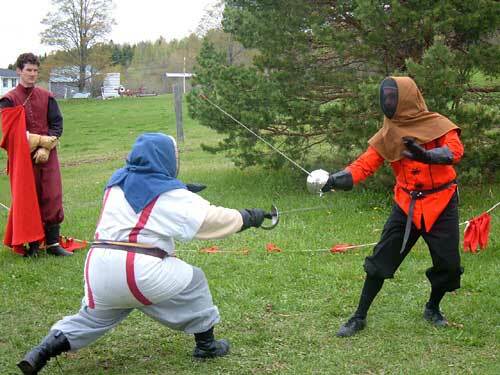 The blue cord identifies me as a Provost in the League of Rapier Academies. March Somethingth, 2007: Pixie Dust has been sprinkled. I'm a warranted Rapier Marshal at Large. ntly be lifted away from my throat when I raise my chin, and it doesn't cover the spiffy gorget. It's also much more convenient for flipping the mask up between bouts. A few marshals would insist on me tying something around the bottom to prevent the hood from lifting, and retying it when I put my mask back on got old real soon. That's my new schlager from ZenWarrior Armoury (an R11 but with the larger 120 mm stainless guard) and my old mild steel buckler. Since then, I've made a shiny new stainless steel buckler.